I’d love to blame WAM being late on drawing that Grand Piano, but actually I was just reading something and completley lost track of time. You ever looked at the clock and seen 9PM and then like two seconds later is says 11? Yeah. Something like that. Boudica seems to be quite popular. Ha ha. That’s good, I think. She is apparently very cute. 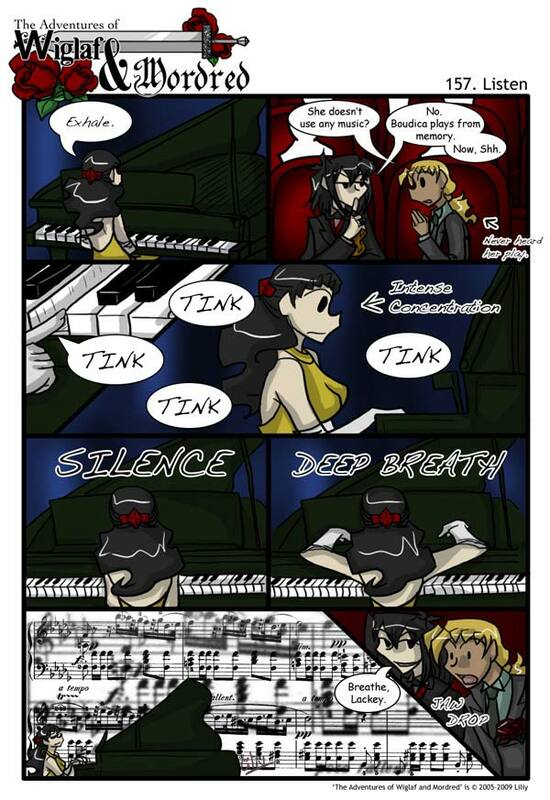 The music in that last panel is a small snippet from Chopin’s Bolero, Op. 19. So maybe she can’t remember dates and things because her head is full of music!! One can be ditzy and still smart. Havent you heard of genius blonds? It’s not that hard though; as long as you play it lots of times over, your fingers remember it easy. Even complicated pieces; it just depends on how agile your fingers are. (So I’m unimpressed by the memorization; but I assume from their faces she played it with marvelous musicianship and feeling. And it sounds amazing.) Nonetheless, their reactions are veery funny. Maybe she has a photographic memory, so that’s how she memorises the music sheets. Not so much–a lot of musicians memorize their music. :3 Wiglaf just doesn’t get out much. Ha ha. Just to join in about 4 years too late :) Pianists tend to play using muscle memory as much as anything else. Kinda like touch typing – I’ve often found whilst playing a piece that the second I think about what the next note is going to be in concrete terms (c# etc) I lose the thread of the music in my head and fail massively. It’s not as hard as it looks to learn the music, but it’s getting it all right *and* adding expression and emotion that makes someone like Lang Lang brilliant.